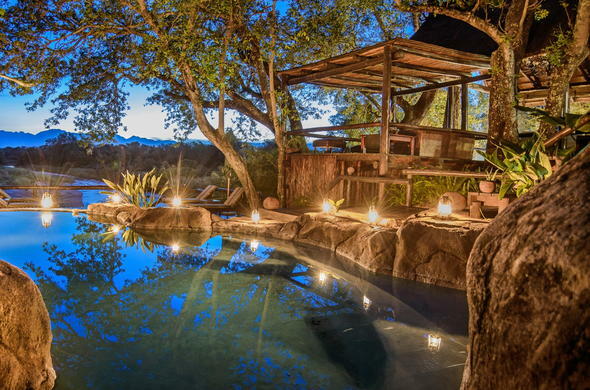 Kuname Lodge offers more than just a safari in a luxury lodge. This Limpopo safari accommodation experiences the essence of Africa. Kuname Lodge's staff is driven by passion for the land, the animals and plants, service and the local community. The guiding principle at the lodge is 'responsible tourism' to preserve this endangered space in Africa and conserve the eco-system. Each visit at Kuname Lodge will always hold a special place in the guests' heart. This is more than just a safari in a luxury lodge. It is the essence of Africa. Kuname Lodge accommodates guests in private, comfortable chalets with en-suite facilities. Each unit is nestled in dense bush and decorated in an elegant African style. With wooden viewing decks overlooking the majestic Drakensberg escarpment, the lodge offers a variety of diverse landscapes, breathtaking views and best game viewing opportunities.